Standard poodles are more than 15 inches tall. If you’ve noticed your standard poodle shaking or itching his head, you might want to look inside his ears. 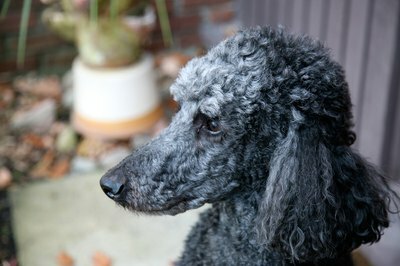 Poodles’ ears are floppy with deep, hairy ear canals where infection, bugs and foxtails love to thrive. Inspect and clean your poodle’s ear often to ensure good health. If you want to avoid expensive vet bills, medications and your dog's suffering, brush and inspect your standard poodle’s ears weekly. This way, his outer ears stay clean and free of mats. Inspect his ear canal to ensure it’s clean and clear of redness, wax and dirt. If your standard poodle has suffered with ear issues, you might want to use a wash for his ear canal weekly. If your dog loves a dip in the pool, pond or lake, dry his ears thoroughly after swimming. Use a powder-based drying agent to absorb excess water after a swim or bath. You might love your standard poodle's floppy ears, but he is prone to chronic ear infections because of them. Your dog’s ears are larger than those of smaller dogs, including toy and miniature poodles, and his ear lies flat and isn’t exposed to air, causing infections to thrive. Yucky infections including yeast, bacteria and the dreaded pseudomonas, love your standard poodle’s ears. Other ear issues include mites and ticks, which also enjoy the warm ear canal. If your dog tends to suffer from allergies, his ears might be itchy. It’s time to take your standard poodle to the vet when he has smelly, waxy, red, itchy ears. Other symptoms of ear problems include constant scratching and rubbing, head shaking, heat and discharge coming from inside the ears. The vet will complete a physical exam and look deep inside the ear canal, swabbing the ear for testing. For infections, your vet will prescribe any combination of oral antibiotics, antibiotics drops, ear wash and daily cleaning. If these treatments fail to solve the problem, suspect allergies and talk to the vet about changing your dog’s diet. Standard poodles definitely require lots of grooming. Use a pin brush with fine stainless steel pins to brush the hair on your dog’s ears weekly. Always brush out your dog’s ears and inspect the inside of his ears before grooming. Buy a hemostat or small scissors from a pet store to trim or pluck the hairs inside the ear canal. Avoid pinching the skin inside his ear or your sure to hear him yelp in pain. You can leave the hair on your poodle’s ears long, but not too long, as they tend to mat. Most groomers leave the bottom of the ear in a rounded style.